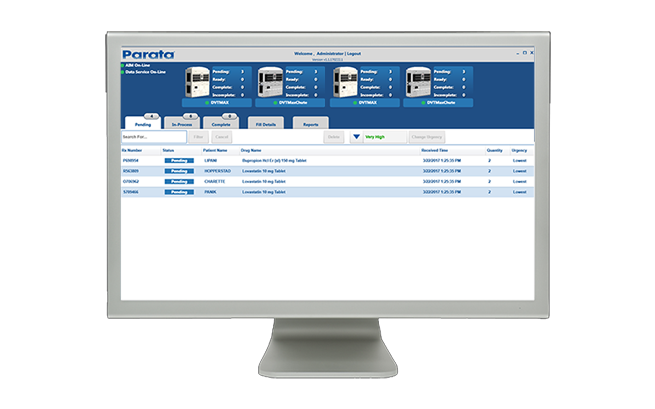 Parata has introduced the software platform that optimizes your use of Max dispensing robots, inventory, and technician hours. Got multiple Max units? The Parata Pivot software platform is designed just for you. Pivot integrates individual Parata Max robots as one — to simplify your operation and boost your efficiency. Now you can scale your operation without adding complexity. Pivot creates a centralized command center to essentially unify multiple Maxes. From Pivot’s central Script Queue View, you can adjust priority for individual scripts. Move urgent orders to the top, and they get filled first. Pharmacies using Pivot for Max have reported efficiency gains that result in benefits their customers notice and appreciate: shorter wait times. Pivot uses advanced analytics to recommend the optimal Max for each order. It considers all scripts in the queue and each unit’s inventory. Pivot lets you share cells — and their data — across multiple units. Register a cell just once and move it between Max units for convenience or redundancy. Pivot centralizes inventory, settings, and reporting for all Max units, giving you better visibility and powerful insights across your entire operation.